Looking back, I’m not sure when it happened, but at some point in my life my “what to see” list when traveling started to tip in favor of places to eat rather than sights and attractions to see. While Kaua’i is a beautiful island with stunning beaches, mountains, canyons, and jungles, as I made my list of what I wanted to do, it pretty much read like a list of local types of food I wanted to try. Along the way, I discovered Lonely Planet’s Kaua’i guide, a book that uses 296 pages to detail the island and does a lot of work to present it through a environmental/sustainable/locavore lens. Excellent resource. Our first afternoon in Poipu Beach we decided to start with the nearby town of Koloa, a five-minute drive from Poipu. With its little town feel that would be right at home in an “old west” movie, our first stop was the highly recommended Koloa Fish Market. Known for good local “grinds”, I was anticipating a chance to sit down and enjoy some great food. We got the great food alright, but since there was no place to sit down we had to take the food back to the condo. This mixed seafood plate has seared ahi tuna encrusted in sesame, boiled shrimp served with dipping sauce, seaweed salad, and poke. Poke (pronounced “poe-kay”, which means “to cut or slice” in Hawaiian) is a common side dish in the islands made from raw fish marinated in soy sauce and other ingredients. We ate a lot of poke and every bit of it was fantastic. Most often, it is made from ahi tuna, the quality of which is amazing. We also had it made with octopus, crab meat, and salmon. Of course, that didn’t stop us from trying as many different things as we could! Another thing we tried is the plate lunch. Well, the styrofoam box lunch. 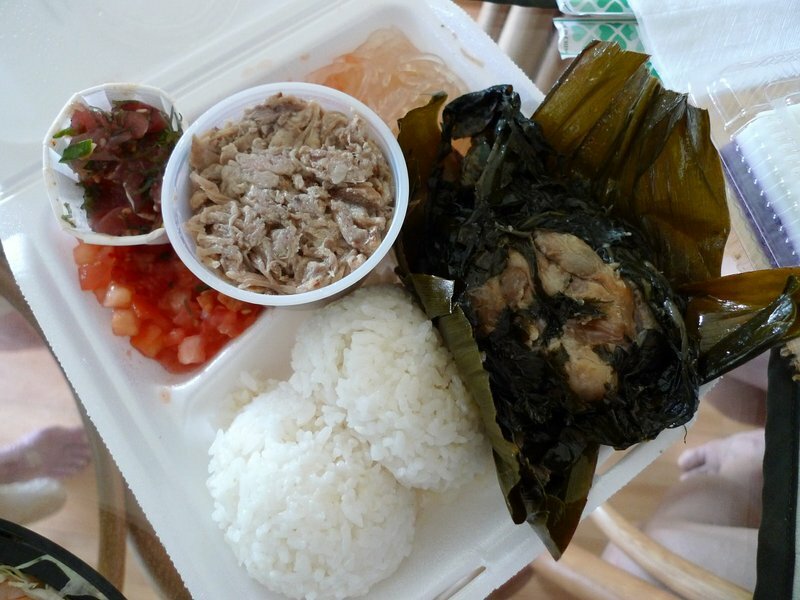 Today’s offering was a mix of laulau (pork steamed in taro leaves and ti leaves), kalua pork (slow roasted, traditionally cooked in a fire pit), rice, lomilomi salmon (minced salted salmon with chopped tomatoes and green onions), and a little serving of poke. Both types of pork were wonderfully tasty. The lomilomi salmon was fine but it was hard to identify that there was any salmon in there. We tried some a bit later in the week that had more noticeable amounts of salmon. For dessert we shared a piece of the fish market’s homemade sweet potato and haupia pie, a market specialty. Haupia is a coconut milk dessert thickened with arrowroot or corn starch. It is very similar to a Thai dessert and is lightly sweet and salty with a thick, gelatine-like consistency. This version is served with a sweet potato base made from purple sweet potatoes, again something familiar to people in Thailand. It is served on a cracker-crumb crust. It was very nice, not overly sweet but pretty filling. All in all, our first meal in Kaua’i was a thumbs up. Relatively inexpensive, good food, simply prepared. Unrelated to the lunch at the Koloa Fish Market was our search for malasadas, the fried dough that came here with Portuguese contract workers, thousands of whom came to Hawai’i in the late 1800s. 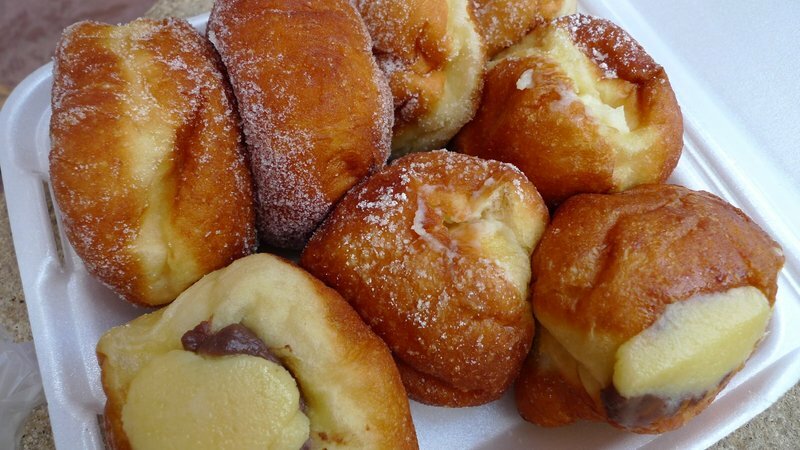 We were looking for for the one-woman stand known as Kaua’i Malasadas, located in from of the K-Mart at Kukui Grove Shopping Center in Lihue. Unfortunately, she was nowhere to be seen, so we stopped at Kaua’i Bakery & Cinnamons in the same shopping center to try some of the different malasadas. The options included plain, chocolate cream filled, vanilla cream filled, and filled with both chocolate and vanilla cream. Lightly sprinkled with sugar and not too oily, I was nonetheless underwhelmed with these fried treats. They are donuts without holes, something that I can’t get incredibly worked up about. This entry was posted in Uncategorized and tagged Ahi, Fish, food, Haupia, Hawaii, Hawaiian, Kalua, Kauai, Koloa, Laulau, Lomilomi, Market, Poipu, Poke, Pork, Restaurant, Salmon, Taro, Ti, Tuna by christao408. Bookmark the permalink. It all looks good. Besides, part of the fun is finding these places. I’m taking notes.. if I ever go back to Hawaii, your post will be so helpful! Love it. I have a feeling Aaron will be drooling over these. The fish looks very good and that haupia is something I want to try. o man that seafood plate’s awesome. The poke and sashimi plate is just so dellicious! The cost is under $15 per plate? poke! laulau! lomi salmon (very good with poi, did you have any?)! it also looks like you got a little chicken long rice on the plate lunch, too, which i also like. sweet potato haupia pie! malasadas (if you go back to honolulu, try them from leonard’s; they’re generally considered the best)! *drool* this is torture! @ElusiveWords – you’re so right! hmm… actually, i’m curious if you tried any kulolo? 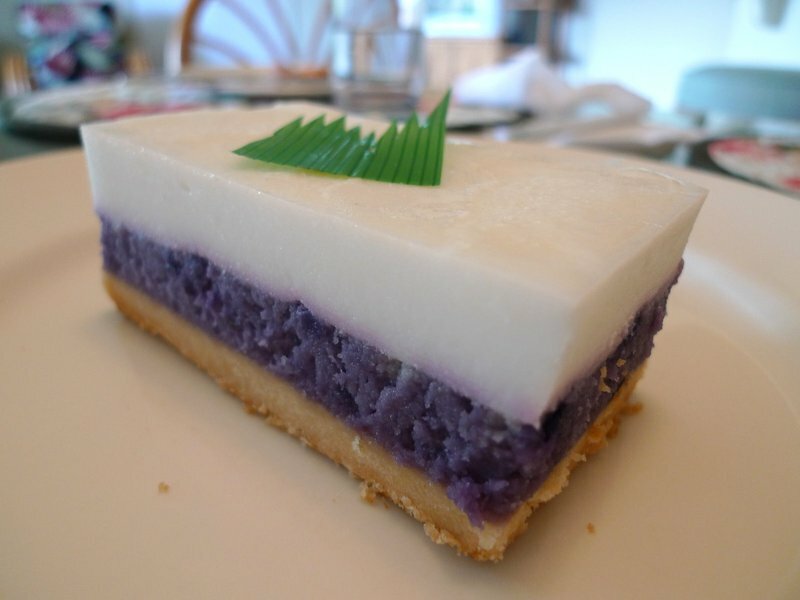 that’s actually one of my favorite traditional hawaiian desserts, but it’s hard to find and pretty expensive. I remember eating there –I over ate of course. You have to search for Kulolo – I agree with Aaron is he yummy but expensive but on holiday who cares. @kunhuo42 – Where’s the chicken long rice? The cup in the middle is the (ostensible) kalua pork. There are some noodles near the top, which I didn’t mention, but the only rice was the white variety. Am I missing something? @christao408 – those clear noodles in the corner are referred to as “long rice” (since the noodles are made of rice). usually, they are cooked with chicken and served with a little bit of broth and maybe some green onions. @oxyGENE_08 – I agree. this was a terrific post. @kunhuo42 – AAAAAAAH. I see. Wow, can’t believe I didn’t learn that while I was there. My producer failed on his job. Oh, wait… these things are self-produced! Erps! @CurryPuffy – I think the plate was somewhere in the $12 range, if I recall correctly. @sassyjessie – @oxyGENE_08 – Thank you both for your kind words. 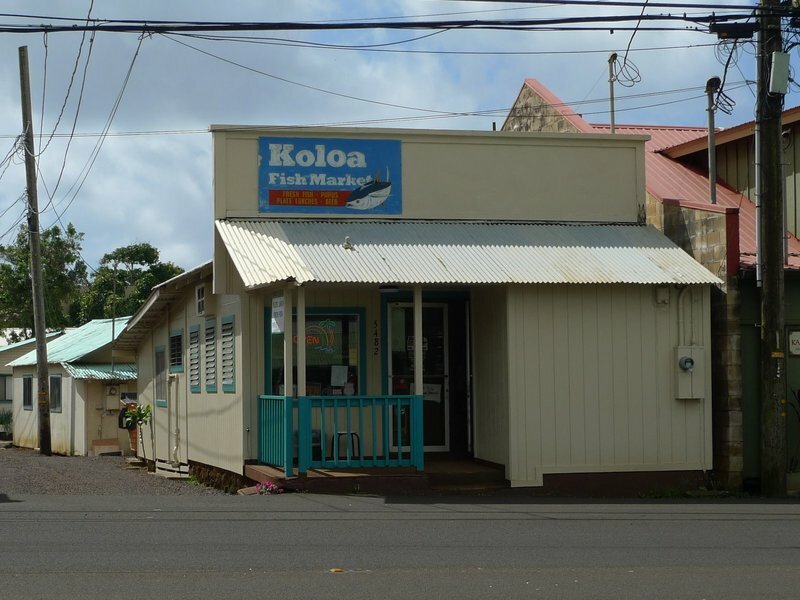 @Fatcat723 – Someone local told me “all roads lead to Koloa” but I think you still have to pay attention otherwise you’ll miss it. @TheCheshireGrins – The ahi was pretty spectacular. @yang1815 – @moolgishin – After trying the poke, Tawn came up with an idea for a version made with Thai ingredients incl. lime juice, fish sauce, chopped lemongrass and shallots. We’re going to think about the right ingredients then try it. @ElusiveWords – Next time you’re in Thailand (hint, hint) we can let you try the Thai equivalent. @awoolham – I hope it proves helpful for you and isn’t all otu of date by that point! =D@amygwen – I agree. When you find these sorts of places, you feel like you’re getting a flavor of local life. The fewer tourists there are in ratio to locals, the better tasting and more affordable the food is likely to be. @christao408 – That sounds great too! @christao408 – so no Krispy Kreme donuts, Kentucky Fried Chicken or a big Mac if I visit BKK? hahahaha…. The purple sweet potato stuff is what caught my eye… I’m thinking it must be good – purple, sweet potato, dessert, yep. You can keep all the raw fish (call it poke or seared or whatever – I’ve taken too many parasitology classes to eat anything raw!) hehe. This all looks so good! I was in Philly over the weekend and look forward to the Vietnamese Hoagies (Bánh mì)when I am there…and Thai food, I find my “what to see” list when traveling started to tip in favor of places to eat rather than sights and attractions to see also. 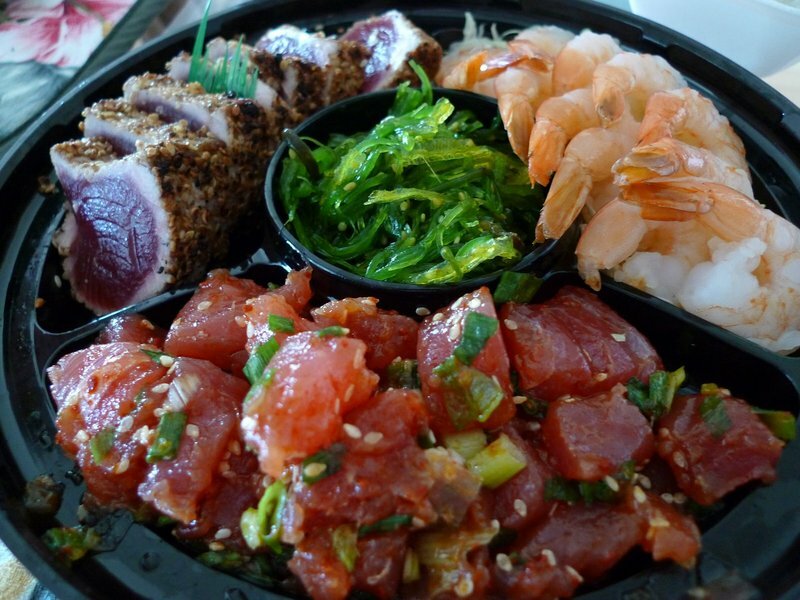 The food looks good…ahi poke is one of my favorites!! Oh, my goodness — my mouth is really watering!!! Laulau’s, lomi salmon, ahi poke, and malasadas — well, malasadas not so much — they’re too much like our filled donuts (with berry jam filling)! The only thing missing from that meal is the sour poi! Makes me homesick for the islands! the poke looks good as well as the donuts! It has been a while since I went to Hawaii. I loved going to the luau which Sheraton had arrnaged for its guests, on the beach, complete with Hawaiian dancers. It was memorable. But those days, there weren’t as many good Asian eateries as there are now, it seems. For me, just being on the beach, listening to the waves and watching the sunsets, was total happiness. Wonderful pictues as usual Chris.